How can we provide better support to convert youth? According to Ta'leef Collective, over 20,000 Americans convert to Islam annually. But, many new converts leave Islam in the first two years after conversion. In this series of small group discussions, participants discussed the challenges faced by and needs of young American Muslim converts, including 'disruption within family context, lack of social support or mentorship, and challenges integrating into the Muslim community.' Also discussed were opportunities and ways in which local communities can better serve those needs including investing in convert care programming and training, promoting integration and a sense of belonging and creating a social and spiritual support network for new converts. 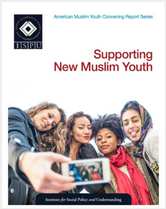 This report is part of ISPU’s American Muslim youth series. Any American born between 1990 and 2000 probably doesn't recall a time when people kept their shoes on at airport security, could go all the way to the gate to see their friends off, or thought 'Patriot Act' was just a good deed. Today's 15 to 25 year olds don't know an America before the horrific events of September 2001. For American Muslims, membership in this generation presents additional challenges, in addition to those faced by other young Americans: from drug and alcohol abuse to racism and a crisis of religious literacy. ISPU's American Muslim youth series series addresses some of these challenges and offers actionable recommendations for parents, community leaders, and national organizations.